"Sorrento Ferry and Hydrofoil departure times, ticket prices and locations help you get to Sorrento from Naples or Capri Italy..."
Being such a hectic city, Naples Italy often ends up being a springboard and a traffic hub only. Mediterranean cruisers usually prefer to head out to smaller and more charming destinations in the Bay of Naples. Besides Capri Italy and Pompeii, Sorrento is definitely one of them. There are a few different ways you can get from Naples to Sorrento and we have covered them in our article Italy Sorrento travel. But now we’re going to explain all about taking a boat, Sorrento ferry from Naples. 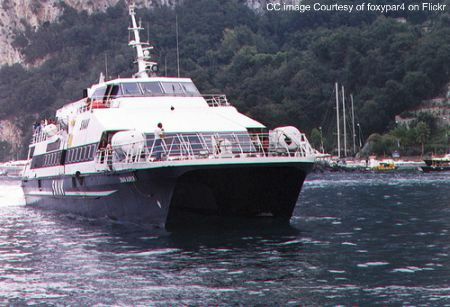 Just as is the case with a Capri ferry, when taking a boat from Naples to Sorrento, it won’t actually be a ferry, but a much smaller boat – called a hydrofoil. A hydrofoil is a boat that takes passengers only, no vehicles. Although a bit pricier, it is much faster than a regular ferry, which is good for you as a cruiser with a very limited amount of time in a port of call. Just like taking a Sorrento Italy train, taking a Sorrento ferry i.e. hydrofoil, has its pros and cons too. 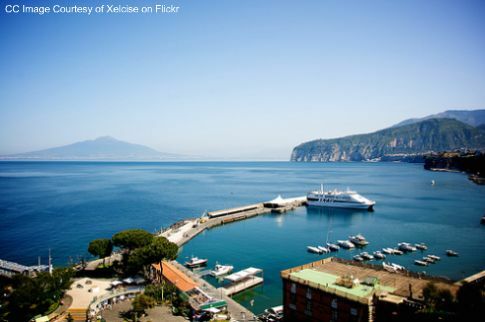 Proximity: the fact that Naples hydrofoil dock Mollo Beverrelo is right next to the cruise terminal, makes Italy Sorrento travel from Naples very convenient for you. No extra cost for taxis or other means of transportation and stressing whether your ship is still in port when coming back- it will be right in front of your eyes. Hydrofoils are clean and safe; coffee and snacks are available for purchase onboard. There are some great views of the Bay of Naples and Vesuvius. It is more expensive than taking a train. The sea can get rough and you could end up being sea sick. Departure/return times aren’t that frequent. When it comes to the procedure of getting from the Naples Stazione Marittima to the hydrofoil dock called Mollo Beverello, buying tickets and finding the right dock… we have already covered it all in our article Capri ferry and hydrofoil. As for the departure times from Naples to Sorrento, as we have already mentioned, they are not very frequent… the boats leave approximately every 2 hours. And the first boat is at 9am only, which is quite late for the Bay of Naples where there is so much to see and do. The ride takes about 30-40 minutes and costs approx. 11 Euros per person one-way. If you plan to see more destinations like Pompeii or Capri on that same day, you would be better off getting off your ship immediately after it docks, which is usually around 7am, and seeing one of those first. But if you’ve been there, done that and Sorrento is your only destination on that day, go ahead and take the 9am Sorrento ferry hydrofoil. After a 30-40 minute ride from Naples, you will find yourself in a small Sorrento port, Marina Piccola, which you can locate on our Sorrento Italy map. Marina Piccola is located at the bottom of a cliff and from there you will need to get to the top where the town is. On how to do that, you can read here. Make sure you know the exact all-aboard time for your ship so you don’t miss it! Many cruisers will take a train from Naples to Pompeii first thing in the morning and then proceed on to the isle of Capri Italy via Sorrento. To do that, you will need to get from Sorrento Italy train station on top of the cliff to Marina Piccola port of Sorrento at the bottom of the cliff. You can locate both on our customized Sorrento Italy map. The quickest and the most hassle free way to do it would be to take a taxi. But if you have time, you can walk for 5 minutes from the train station to Sorrento center and from there catch one of the local blue buses in Piazza Tasso. They will take you down to the Port. The only problem is they are not very frequent. If you find yourself waiting for too long, you can always walk down the 200 steps!